UPDATE – On Saturday, August 27, 2016, a male juvenile was found unresponsive in a pool. The child was transported to VCU Medical Center where he was pronounced deceased. The child has been identified as Giovanne Samuel Ofuso Antwi, 5, from Dumfries, VA.
Investigators continue to investigate the circumstances surrounding this incident and are working with the Medical Examiner’s Office to determine the cause of death. Anyone with information on this incident is asked to contact the Hanover County Sheriff’s Office at (804) 365-6140 or the Metro Richmond Crime Stoppers at (804) 780-1000. Citizens can also text Crime Stoppers at 274637 (CRIMES), using the keyword “iTip” followed by their tip. Both Crime Stoppers methods are anonymous. HANOVER, Va. – On Saturday, August 27, 2016, at approximately 2:46 p.m., the Hanover County Sheriff’s Office, along with Hanover Fire/EMS, responded to the 16200 block of International Street for report of an unresponsive male juvenile in a pool. Once deputies and medical personnel arrived on scene CPR was immediately began. The male juvenile was transported to VCU Medical Center where he was pronounced deceased. 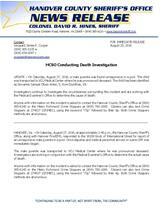 Investigators are working in conjunction with the Medical Examiner’s Office to determine the actual cause of death.